This is a heart-warming adventure that’s beautifully crafted and explores many themes: friendship, the need to belong, and the interconnectedness of people with nature. An outstanding book of its kind. ‘No creature on earth can do that!’ said Jax. ‘But Peng is not from this world,’ the Abbot replied. From the moment Peng fell from the stars as a tiny young creature, he and Jax have been connected. 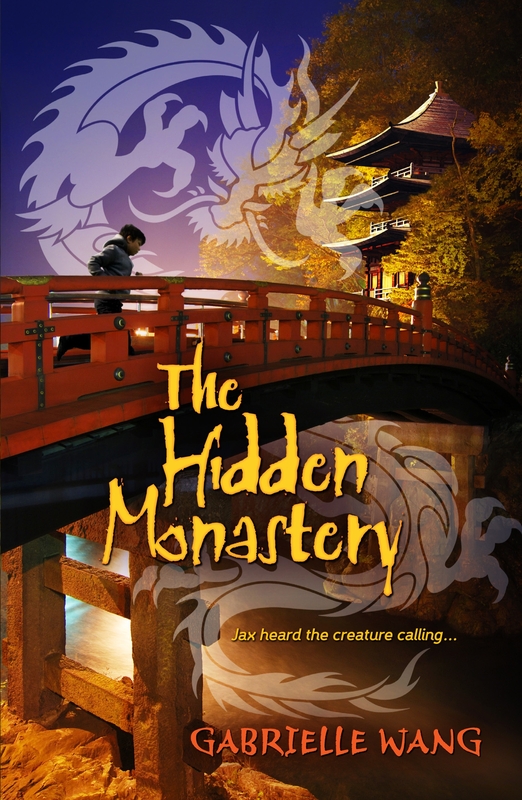 But it is not until twelve years later, when Jax stumbles across a mysterious monastery hidden deep in an ancient rainforest park, that he begins to discover his destiny, and what it means to be a Peng Master. “The very visual text places the reader right at the centre of the action. There are far more elements in the story than can be shown here, the forces of nature, Jax’s family life, the difficulties faced by migrants, street thugs, all of which are pulled together in a taut fabric. Ideas for stories come in many forms and at anytime. The Garden of Empress Cassia came to me in a dream. The Pearl of Tiger Bay was inspired by a childhood memory. The Hidden Monastery appeared as an image in my mind. The vision was of a boy with a birthmark in the shape of a creature on the palm of his hand. As the boy blew on the mark, the creature came alive, stood up, and danced on his palm. I travelled to the Daintree rainforest in Queensland to do my research and to China to visit monasteries there. As we climbed up the many steps to the top of Putuoshan, Buddhist chanting came out of loudspeakers disguised as rocks. Tourists were dressing in opera costumes to have their photos taken. On the eaves of buildings were qilins, creatures with wings on their hind legs and shoulders. One statue was an elephant lifting its trunk. There were also fantastic dragons with bristling tails that circled back to meet the head – almost as though the dragon was eating its own tail. Monks and nuns were everywhere. That night there was a full moon. I stood in front of the monstrous knocker on the monastery door and imagined what it would be like for a boy to approach the doors of a monastery in the middle of the night. So dark and spooky. Standing in front of an ancient pagoda I gazed up at the moon. It wasn’t hard to imagine being another person admiring the same moon in exactly the same thing spot one thousand years ago. 1000 year old gingko trees, one on each side of the door. Massive. How can anything live that long? What have they seen? If they could talk what would they say? When I was a child, I saw a movie on TV called 20,000 Leagues Under the Sea, a story by Jules Verne. Ever since then I’ve been fascinated by deep sea creatures. It was only a matter of time before I would write about one. While doing research for The Hidden Monastery on the internet, I came across an article about Bloop, the nickname given to a mysterious recording that was picked up by US navy spy equipment in 1997, and again in 2002. This equipment was a relic from the Cold War between USA and Russia, but when Russia was no longer deemed a threat, the equipment was given over to science. The Bloop, the scientists say, was more powerful than any calls made by any known creature on earth. This background information was perfect for my creature, Peng. Around 256BC in China, there lived a philosopher called Zhuangzi. His philosophy comes in the form of stories, and one of these tales tells of a creature that starts life as a giant fish, then changes into a huge bird called Peng. This creature is so powerful he can stir up the water for three thousand miles around. And is so big his wings cover the sky like clouds. Zhuangzi’s creature greatly inspired the Peng of my story .